John Cloud Jacobs, in his article The Last Buffalo, reported on his 1872 bison stalks by saying "so long as our course was straight, up to about 400 yards, they could not make out what we were, but if we ever took just one step to the side, the herd was lost". 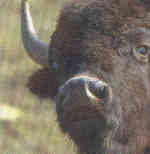 The side positioning of bison eyes limits the range in which there is depth perception. Yet, because of this side positioning, they have an approximate 330-degree field of vision. That's is why it is so hard to sneak up on a bison from behind. You will find their hearing and sense of smell to be quite exceptional with their hearing range similar to 'humanoids'. A raised tail is a sure sign of trouble. The higher the tail, the bigger the trouble. Most hunters will not see this behavior exhibited unless the bull is wounded and he fe els threatened by the approaching hunter. A charge is surely forthcoming! Due to the eyesight characteristics outlined above, you are better off to run to the side, and not directly away from the bull. But, since a bull can out run a horse for ¼ mile, it's pretty certain he will catch you! Much like that of a charging lion or leopard, you must stand your ground and fire. There is no other avenue of escape! Head waiving, pawing and snorting are other ways they communicate "action will follow". Stampedes are not often seen in modern buffalo ranching. Stampeding bison are not afraid of you; but are rather, of the close proximity of other, more dominant, horned, excited bison at their heels. They know they are probably going to get gored or killed. Thus, they are running to keep from getting hurt. Bison are not confrontational animals. Escape via open space will always be their first choice when threatened. Only when trapped or agitated, will they charge. Never put yourself in a situation to be challenged, as they will win. Never turn your back on a bison. They are wild animals and as such are very unpredictable. A startled buffalo can settle into a gentle lope that can go on for hours. This is why your first opportunity to harvest your trophy bull, will be the best opportunity. Like any animal, they become keenly cautious once alerted. Your first stalk will be easier than your second, third or fourth. David Rice discovered this on his bow hunt and he relates his interesting story in Bison with a Bow.